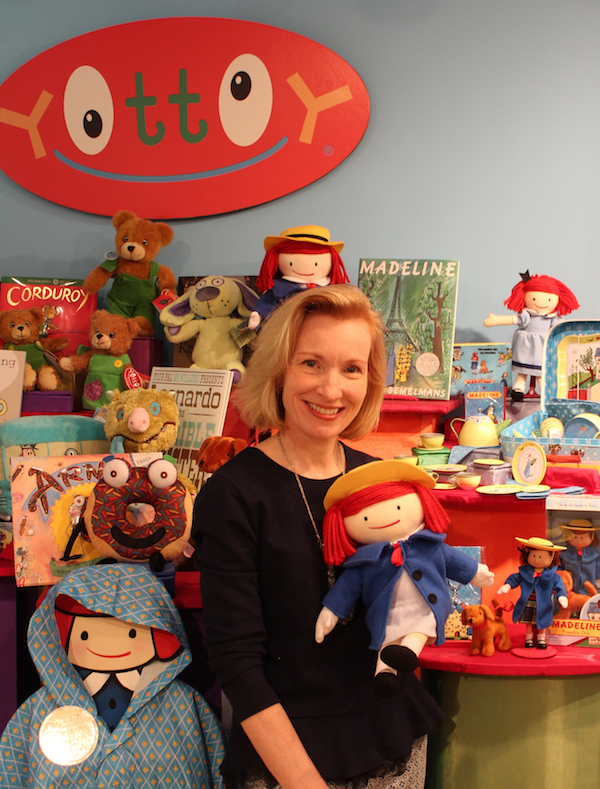 Guest Post by: Kate Karcher-Clark, founder of YOTTOY Productions, Inc.
My passion for toys and design came at an early age in Memphis, TN, as the youngest of six children with a resourceful mother. As a child, I shopped with my mom and noticed all of the beautiful stuffed animals in “fancy stores” and longed to have those toys. Since we couldn’t afford them, I would sit at her sewing machine and figure out how to make my own original toys. Sewing and other crafts have always been a hobby of mine. Even as I earned a BA in fine arts and English at William Woods University in Missouri, I continued to sew, dye fabrics, create patterns for clothes, weave, design cards, marketing flyers, sorority room decor, linens, t-shirts, and more. I became well-known on campus as the girl who was crazy enough to make just about anything. I was determined to make it in the art industry. After graduating, I sold my VW Bug, packed handmade clothes around a sewing machine my grandmother gave me and bought a one-way ticket to New York City. I landed in the toy industry after interviewing with a toy company in search of a product manager. The company focused on mass-market and promotional toys, which gave me a solid foundation for the costing and manufacturing processes. By 1995, I was ready to pursue my dream of starting my own toy business. I realized there was a void in the toy market for high-quality designs with real style. I wanted to make toys that inspired children’s imaginations and risked my life’s savings to realize my goal. I leased a former fabric factory in Manhattan’s Garment District, asked a friend, Peter Doodeheevfer, a talented designer and Parsons graduate, to join me and started YOTTOY (yàht-toy, “toy” spelled backward and forward). Peter and I worked around the clock to grow our unconventional toy company. Our first products were a combination of originals like our classic YOTTOY Velveteens along with storybook characters, including The World of H.A. Rey (creator of Curious George) and Mr. Night. We marketed YOTTOY as a company that could do just about anything in the toy world, from any direction – just as our name, a palindrome, reflects. Clients were attracted to our natural intuition for value and product uniqueness. We created toy concepts, character maquette, mechanized toys, miniature collectible figures, medical demonstration models, and other custom promotional products. As the year 2000 approached, YOTTOY formally launched high-quality book and toy companions, bringing story time to life with a variety of designs inspired by the most beloved children’s literature. YOTTOY now has a specialty collection that ranges from high-profile and timeless literary and entertainment classics in Paddington Bear, Madeline, Babar, Frog & Toad, Eloise, and The Velveteen Rabbit as well as contemporary favorites, including legendary Mo Willems, Greg Pizzoli, Arnie the Doughnut, and Little Blue Truck. Styles range from soft early developmental toys and detailed posable dolls to tin tea sets and accessories. We attribute our growth to strong customer connections. They know that YOTTOY delivers the finest-quality, meaningful character toys and gifts at surprisingly sweet prices. Customers realize the special connection and comfort that YOTTOY toys and books bring to youngsters, and value the memories made during story time between parents, grandparents and children with our toys and books in hand. Consumers and wholesalers trust us and are dedicated to YOTTOY because they know we don’t cut corners and genuinely care about every aspect of every item and everyone we work with in our business – from the authors and illustrators we represent to material suppliers, factory workers, shippers, store owners, and staff. Great care and attention go into every toy that YOTTOY creates. Our success is grounded on experience and reliability. We’re proud to always meet deadlines, use the finest-quality materials and offer our products at competitive prices. Great care and attention go into every YOTTOY creation. We use smart design and clever construction to help us maximize production efficiencies, and we place a lot of emphasis on the adage, “The devil is in the details”! We learned to pay attention to the fine print to ensure costs – from manufacturing to shipping – and profit margins are aligned. We also keep an eye on consumer spending trends and factor in retail requirements and compliance. As a mother, I realize how important mind-engaging toys are to kids’ well-being, to help them understand relationships and learn through positive play experiences. Today more than ever, children need tangible soft toys to cuddle peacefully and care for to develop natural human-to-human bonds, feel loved, and build meaningful relationships. Giving back is also important to YOTTOY, and it’s something we’re proud to do. We donate to schools, libraries and museums, and are honored to be a vendor agency for Kohl’s Cares that supports initiatives that serve children and families nationwide. Visitors to YOTTOY’s sunny design studio in the heart of Manhattan say that real happiness beams from our toy shop – just as it is reflected in our YOTTOY smile logo.